We need to listen with greater intent to our kids. There are so many who are aching with hurt and being silent. They are uncertain where to turn and often question if there hurt is valid. 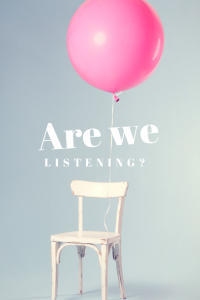 I believe the manner in which we listen can influence how we see them and how well we pick up on concerns that need to be addressed. Did you know how we listen to our kids can make them healthier, stronger and safer? Our ears and eyes can be the best form of defense for emotional support and being aware of our kids well being. As adults we can assume that being a teen is the same emotionally as it was when they were kids. That reality is vastly off base due to one factor: cell phones. Growing up in a world mired in an impersonal connection is doing tremendous damage to our kids self image, ability to communicate and connect. We have more kids than ever struggling with how they view themselves and struggle with speaking up when they are sad, anxious and feeling lost. They are hiding behind their phones and many feel lost and disconnected. Ask questions that require more than a yes or a no. From how their day went to if they are in a good or a bad spot, we need to have a pulse of how our kids are faring. Boundaries, self care and awareness …. Raising teens is the farthest thing from simple or easy. We want to keep them from harm, heart ache and disappointment. But I believe we have more kids than ever tired, overwhelmed and feeling alone. I believe, without doubt, the greatest culprit is their phones. So what does this mean? Let’s break down a few ways to protect their emotional well being while conveying that you are approachable and believe emotions are real and not merely an excuse. The flip side of our kids emotional stability…. We have a TON of our kids taking on the role of counselor or crisis manager via their friends. Often, our kids are uncertain of where to turn. If a friend speaks of self harm, having thoughts of ending their life or popping pills again they are asked to promise to not say anything. In exchange, they vow to not harm themselves. The level of stress in these situations is unfathomable. We have to reassure our kids they cannot fix someone who is hurting so badly. Professional help is desperately needed and a promise to stay quite is unfair to both parties. But this happens every single day. How the heck do I address this? Being a teenager is crazy tough. Taking on someone else’s crisis on top of yours in a sure fire mix for disaster, loss of sleep, stomach aches and angst. It’s an unfair weight to assume. It’s ok to bring this topic up repeatedly (not daily;) in different forms. When you are a kid it can feel like stepping forward to an adult means you’re a traitor, breaking trust and it’s the point of no return. Our dialogue is important. It’s also key for us to stress that if our kids are not comfortable broaching a topic with us, it’s ok to chat with another adult (guidance counselor, SAC counselor, aunt, grandparent, etc.). Give them ideas for their options. This reaffirms that their feelings are real and they are not alone. Too many of our kids feel alone, are uncertain how to ask for help or who to chat with. In a day an age with overwhelming mental health resources, the stigma of mental health being for someone with ‘serious issues’ or who is ‘crazy’ is holding SO many back from receiving the help they need. Our piece in the puzzle…. Mental health is real. Defining HOW to get help is SO important. Keep the chat going and remind them how greatly you love them, their voice matters and that they are valued beyond words. Our voice and compassion matters. Take a deep breath and know that every step is a positive and the more we know the better shot we have. Keep going forward, gaining insight and fighting the good fight. Peace, love and parenting!